We love gemstones for their beauty and rich colors. These precious gifts from nature are extremely desirable when it comes to creating jewelry pieces like rings, earrings, pendants, mangalsutra, necklaces, nose rings and more. The possibilities are endless. The beauty of a natural gemstone is irreplaceable. None of the man-made gemstones look and feel the same. There is a certain weight and texture to natural gems, that make every gemstone one-of-a-kind treasure. Even though we know how cool these are, sometimes people think gemstones are too expensive for them to afford. If that sounds familiar to you, you’re in luck. 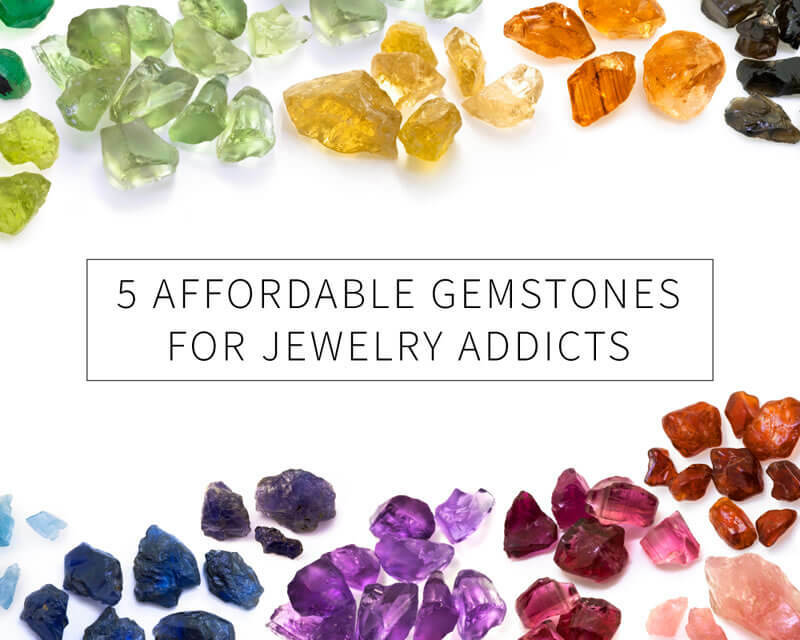 In this article we will be sharing top 5 gemstones that are affordable and fun. Before we get started, I’d like for you to know that “affordable” is relative term. For the purpose of this post, “affordable” means the gems are not as expensive as precious gems such as diamonds, rubies, emeralds, and sapphires. Tourmaline is one kind of a gem that has a huge variety of colors. It could potentially fulfill all your aspirations for a beautiful gem, without breaking the bank. The sparkle in the tourmaline depends on the cut of the gem. Poorly cut gems are not of much value. Tourmaline should have a great sparkle in order to reflect light throughout the gem. 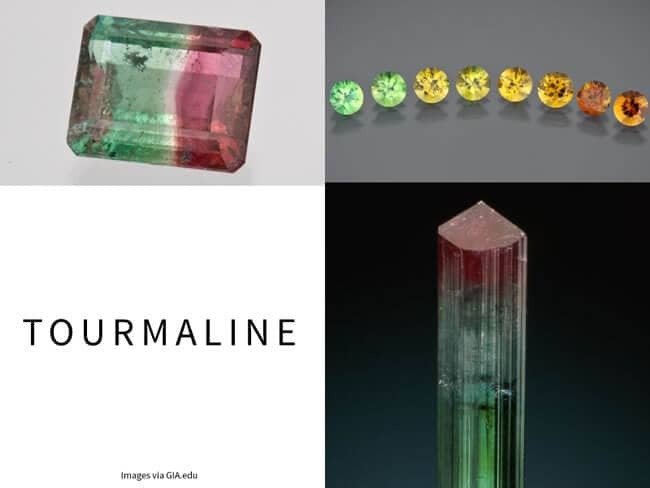 Until 1900, USA was considered to be the primary source of tourmaline but today most of it comes from Brazil, Afghanistan, Australia, India, and Myanmar (Burma). Tourmaline is a birthstone for the month of October along with Opal. Tourmaline is also a gem of 8th anniversary. Zircon comes in the variety of colors. The most popular is the colorless zircon. It is often used as a substitute for a diamond. 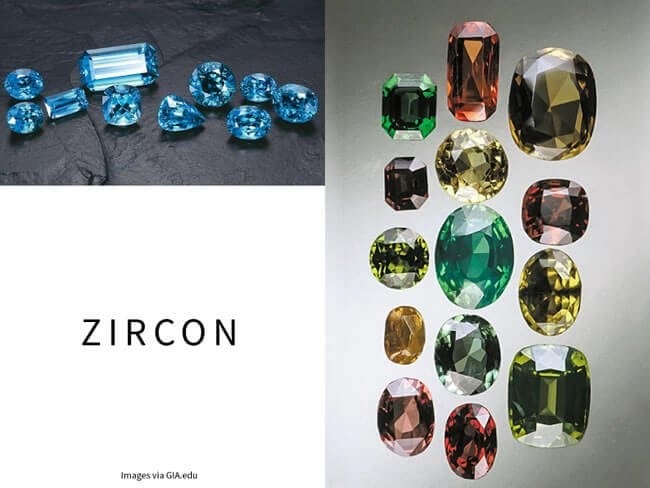 Zircon also comes in many colors like yellow, green, red, reddish brown and hues of blue. Turquoise blue is a popular color for Zircon and I personally love it a lot. Zircon is also known to induce a sound sleep and attract prosperity and growth. Zircon is a birthstone for the month of December, along with Turquoise and Tanzanite. Citrine is one other hidden gem for all of you that love the vibrant warm hues of yellow and orange. Citrine is generally a transparent, pale yellow to brownish orange color gemstone. It is one of the most popular yellow gemstones and a beautiful alternative for Topaz or Yellow sapphire which can be more expensive. Citrine’s beauty, durability, and affordability makes it a top-selling yellow to orange gem. They are also found in many sizes and the carat weight goes as high up to 20 carats. Although one thing you must keep in mind that natural citrine is rare, these days most citrine quartz is found due to heat treatment of amethyst quartz. 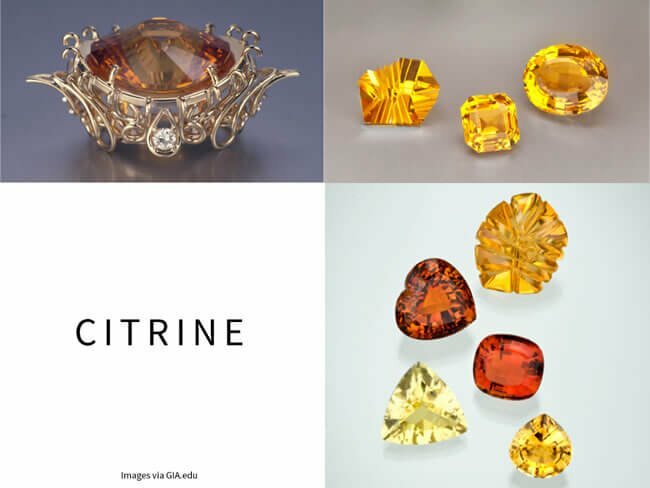 Some of the jewels from the Victorian era were was found to have citrine in them which means that it was treasured even in the good old days. Citrine is a birthstone for November along with Topaz. It is also a gem for the 13th anniversary. This very unique purple gemstone has the power to mesmerize any women. It’s a beautiful gem but very affordable for your jewelry pieces. 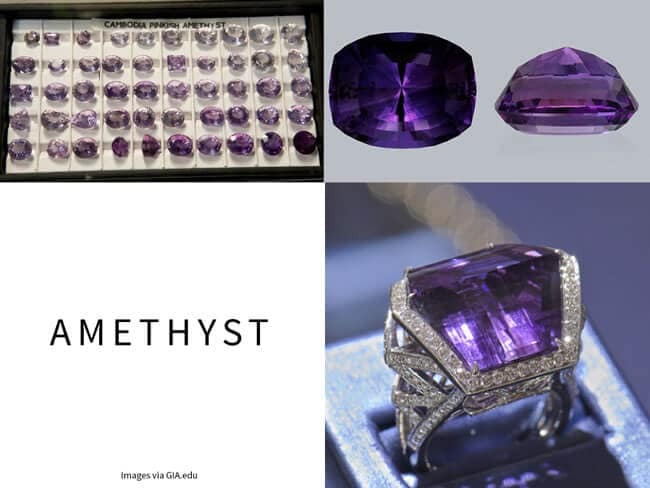 Until 19th century Amethyst was considered to be very expensive until a very large deposit was discovered in Brazil. Today the is the most valued quartz in the market of designer jewelry. Its wide variety hues of purple appeal to a lot of consumers. Since it has a wine line color, Greek legends associated amethyst with Bacchus, the god of wine. On the contrary other believe that amethyst kept its wearer clear-headed. Amethyst is a birthstone for February and the gem for the 6th and 17th wedding anniversaries. Peridot is found in lava, meteorites and deep in earth’s mantle. It’s color is bright yellowish green that is extremely attractive. The Egyptians called it the ”gem of the sun”. Since larger sizes of this gemstone are still expensive, one could find smaller gems for their jewelry at all price points depending on the color and size. As I mentioned peridots are found in lava, the deposits are found on the surface when the earth crust splits and the rocks from the mantle are pushed to the surface. Only on rare occasions, it’s found that peridots come from extra terrestrial source like meteorites that have fallen on the earth. Peridot is made of a mineral called olivine. Its chemical composition includes iron and Magnesium. 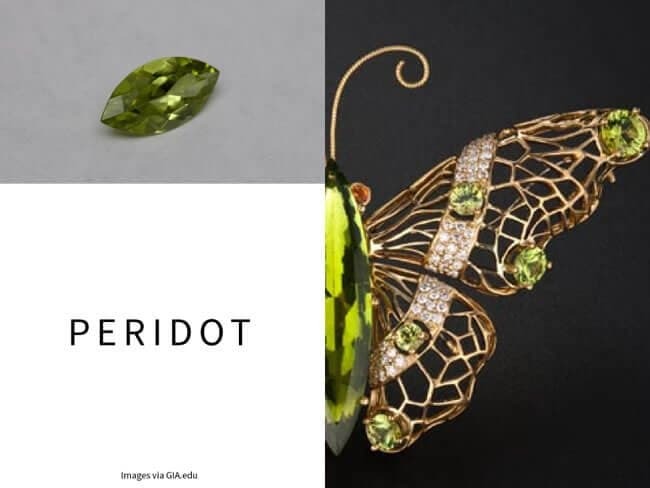 Peridot is a birthstone for August and is a 15th anniversary gemstone. Well, that was quite colorful and inspiring. I hope you are inspired by these gems as much as I am. Please let me know in the comments below which was your favorite gem and why? Jinal Sampat is jewelry designer at Sampat Jewellers Inc. Her focus is on innovation and creation of jewelry pieces that are meaningful and hold long-term value. She creates versatile mangalsutra designs with Indo-Western elements. Jinal holds her graduate degree from Rhode Island School of Design (RISD). You can find her on Instagram.